The nation’s first high-speed rail project is under construction in California’s Central Valley as of the date of this report. 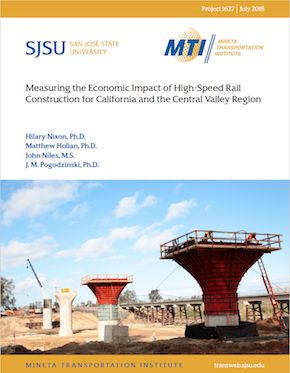 This research analyzes the immediate economic impacts, focused on employment and spending generated by California High-Speed Rail (HSR) Construction Package 1 (CP1) in the Central Valley and the rest of California. The authors use a two-pronged approach that combines original economic analysis and modeling with case study vignettes that explore the economic impacts through the lens of a sample of businesses and individuals directly impacted by this phase of HSR development. Overall, the economic analysis suggests that CP1-related spending (forecasted through to 2019) will lead to more than 31,500 additional jobs (both part-time and full-time) by the year 2029. Growth is concentrated in Fresno County, with the number of additional jobs estimated at more than 15,500. The analysis considers job growth across a number of alternative scenarios, converting the raw jobs estimates to full-time equivalent job-years. Under the most conservative HSR spending scenario considered, over the 15-year period evaluated, more than 25,000 full-time equivalent job-years are created. This amount to 14,900 jobs per billion (real) dollars of spending, or a cost of approximately $67,200 per job-year. Dr. Nixon is professor of urban and regional planning at San José (Calif.) State University. Her research and teaching interests in environmental planning and policy focus on the relationship between environmental attitudes and behavior, particularly with respect to waste management and linkages between transportation and the environment. She holds a BA from the University of Rochester in environmental management and a PhD in planning, policy, and design from the University of California, Irvine. Matthew J. Holian is a Professor at San Jose State University in the Economics Department where he teaches Cost-Benefit Analysis, Econometrics and Microecoomics. He completed his Ph.D. in Economics in 2008 at the Ohio State University, and his recent scholarly publications have appeared in journals such as Journal of the Association of Environmental and Resource Economists and Ecological Economics. John Niles is Research Director at the Seattle think tank Center for Advanced Transportation and Energy Solutions (CATES), and a Research Associate of the Mineta Transportation Institute. His research interests include high-technology vehicle deployment strategies and impacts, urban transportation policy, and public transit productivity. John is the author or co-author of many reports and essays, including a chapter in the book Road Vehicle Automation (Springer, 2014) and the essay “Planning for transportation-as-a-service” in Ontario Planning Journal. He earned an M.S. in industrial administration at Carnegie Mellon University and a bachelor’s degree in mathematics from Massachusetts Institute of Technology. Mike Pogodzinski is a professor of economics at San Jose State University. His areas of research interest are transportation economics, economics of education, and state and local finance. He has participated in previous Mineta Transportation Institute research studies on the effect of park-and-ride on bus transit efficiency and bikesharing in the Bay Area. His research frequently involves the use of geographic information systems (GIS) software. He has frequently presented on GIS applications at Esri conferences.